Medieval romances generally fell into four categories: the Matter of Rome, which dealt with such classical heroes as Alexander the Great and Julius Caesar; the Matter of France, whose tales were inhabited by Charlemagne and such heroes as his nephew Roland; the Matter of Britain, which encompasses the Arthurian legends; and the Crusade Cycle, which dealt with the doings of Godefroi de Bouillon and his friends during the First Crusade. Now, to be sure, all four have left their mark on our culture – Alexander and Caesar are still very much remembered, albeit today more for their actual histories than the medieval legends about them. Godefroi’s home castle at Bouillon remains intact; but although his tomb in the Church of the Holy Sepulchre vanished around 1806, his memory is still venerated by the Knights of the Holy Sepulchre as their founder and his sword, spurs, and cross are still used by the Latin Patriarch of Jerusalem when creating more knights. Charlemagne’s significance is greater still. The great Emperor has left sufficient descendants in the United States alone to warrant their forming an association of their own. In Europe, many proponents of that Continent’s unity see him as a forerunner. At Aachen and Frankfurt Charlemagne is honored as a blessed, and his cathedral in the former city houses his shrine; the great pilgrimage target of Santiago claims him as a founder, as does the nation of Andorra (a belief enshrined in her national anthem). His crown is in Vienna, and two swords – each claimed to be his Joyeuse – can be found in that city and in Paris. Roland is commemorated at both Roncesvalles, where he fell, and at Rocamadour, where his sword, Durendal supposedly rests. Charlemagne’s companion, William of Orange, founded a monastery and became a Saint, while Ogier the Dane is commemorated at Kronborg Castle in his homeland – also sacred to the memory of Hamlet. Yet despite all of this, the figure who emerged most powerfully of all from the mist and fog of Medieval legend is Arthur. Neither an emperor nor a crusader, but in all likelihood the last Dux Bellorum of post-Roman Britain, he has held (and holds) a greater grip on the imagination of the West than all the other figures of Romance combined. Scholars and archaeologists scramble to try to find the locations wherein the deeds of Arthur and his men took place. Sites all over Britain claim him; but so do Brittany, Normandy, and even Spain. What is the cause of this fascination? None could claim that Arthur’s Knights of the Round Table were braver than Charlemagne’s Twelve Peers; if it is strictly wonder you want, Oberon was surely a match for Merlin. No, what made Arthur and the brave knights so unique, what gave them a power over the heart and mind that has lasted until today, was their association with and hunt for the Holy Grail. …anon they heard cracking and crying of thunder, that them thought the place should all to-drive. In the midst of this blast entered a sunbeam more clearer by seven times than ever they saw day, and all they were alighted of the grace of the Holy Ghost. Then began every knight to behold other, and either saw other, by their seeming, fairer than ever they saw afore. Not for then there was no knight might speak one word a great while, and so they looked every man on other as they had been dumb. Then there entered into the hall the Holy Grail covered with white samite, but there was none might see it, nor who bare it. And there was all the hall fulfilled with good odours, and every knight had such meats and drinks as he best loved in this world. And when the Holy Grail had been borne through the hall, then the holy vessel departed suddenly, that they wist not where it became: then had they all breath to speak. As a result of this occurrence, the Knights of the Round Table begin the Quest of the Holy Grail; only Perceval, Bors, and Galahad achieve it: “Then looked they and saw a man come out of the Holy Vessel, that had all the signs of the passion of Jesu Christ, bleeding all openly, and said: My knights, and my servants, and my true children, which be come out of deadly life into spiritual life, I will now no longer hide me from you, but ye shall see now a part of my secrets and of my hidden things: now hold and receive the high meat which ye have so much desired.” Now, as in the real life of the time, the Arthurian romances are filled with liturgical references; as John Hobson Matthews tells us in The Mass and its Folklore, “King Arthur’s knights, good, bad and indifferent, all turn in to wayside chapels to hear Mass, as naturally as in the present day their descendants would enter the newsrooms of their various clubs.”The identification of the Holy Grail with the direct and bodily apprehension of the God whom the Knights were used to receiving under the appearances of bread and wine charged the legends with a power which has not abated today. To mention a very few modern Catholic (or Anglo-Catholic) writers of the past century who were influenced by the Grail, we may cite Britain’s G.K. Chesterton, Charles Williams, Arthur Machen, T.S.Eliot, and, of course, J.R. R. Tolkien; France’s Louis Charbonneau-Lassay; Austria’s Richard Kralik (who called the circle of writers around him the “Gralbund”); and Italy’s Attilio Mordini, Giulio Schettini, and Giovanni Cantoni. The other arts too have benefitted from the Grail, as seen in buildings ranging from the parish church of Tréhorenteuc in Brittany to the Boston Public Library. Naturally, the question arose, what has become of the Grail? If it is real, where may it be found? In a word, the quest of the Grail has continued to the present day, and there are a number of candidates for Grail-hood, so to speak. While we think of it as a cup, some sources speak of a bowl or dish – and so the Agate Bowl of the Habsburgs in Vienna and Genoa’s Sacro Catino have been proffered – the latter’s green colour suggests Wolfram’s emerald (the discovery that it was merely green glass, while disappointing to Romantics does make it likelier it might have been used at the Last Supper). Some claim that it is Wales’ Nanteos Cup, or else that it is hidden in some strange spot: the Chalice Well in Glastonbury, mayhap, or else in Scotland’s Rosslyn Chapel. But the likeliest choice for those questing after the Grail, it appears, is not to be found in the British Isles, but in Spain, in the Cathedral at Valencia. There it is guarded not only by the Archbishop and his canons, but by the Confraternity of the Holy Grail and the Royal Brotherhood of the Holy Grail (membership in the latter body being restricted to members of the Valencian nobility – reminiscent of Eschenbach’s Grail Knights). Often, the medieval Romancers made much of the “Hallows” – the instruments of the Passion which were often said to have been at least initially stored with the Grail – and which, too, would have been spattered with His blood, as would have been both the Cross upon which He hung and the cloths used to bury him. Relics of the True Cross are widely dispersed, of course, and so fairly accessible to the pilgrim – though the canard that there are enough to build a ferry boat was exploded by the work of Rohault de Fleury, which showed a large chunk of it is still missing. The Crown of Thorns may be found at Notre Dame de Paris, though the thorns thereof have been scattered far and wide. Many of the relics of the Passion (especially the title Pilate wrote for the Crucifix) are venerated at the Roman basilica of Santa Croce in Gerusalemme; not too far away from there is St. John Lateran with the Scala Santa, the “Holy Stairs.” As one climbs them on one’s knees, over the protective wood covering that shield the actual steps, one may see the blood-stains left by Our Lord as He climbed them to the Praetorium. That blood also spurted when the nails were hammered and the lance thrust in His body. The nails were scattered, and often bits shaved off fragments of the originals and used in making whole nails; numerous as such relics are, the most famous was itself hammered flat and used for the interior of the Iron Crown of Lombardy. As for the Holy Lance, there are several weapons that are said to be the one which pierced the side of Christ – the one in Vienna’s Hofburg may have the best claim. As any who follow the Stations of the Cross well know, Our Lord’s bloodied face was wiped by St. Veronica on His way to Calvary, and wrapped in cloths after His death. The former cloth, Veronica’s veil, is at the Vatican, though a number of highly venerated copies were made. As for the funeral cloths, one is at Oviedo, in Spain; the other, most famously, resides at Turin. But all these blood stained relics aside, what of the contents of the Grail? What of the Holy Blood of Christ collected in it after the Crucifixion by St. Joseph of Arimathea? It was alleged that some of this blood was saved, and has been preserved in various places ever since. St. Thomas Aquinas opined that all such blood was reabsorbed by Our Lord at the Resurrection; but Pope Benedict XIV countered that some drops might well have been left behind. However, it would no longer be united to Jesus’ Godhead, and so is worthy of veneration but not adoration. Such relics were eagerly sought after during the Middle Ages, and may be venerated today at Bruges, Mantua, Sarzana, Clauzetto, Verona, Fecamp, Neuvy-Saint-Sepulcre, Rothenburg ob der Tauber, Weingarten, Reichenau, Bad Wurzach, Weissenau, Heiligenblut, and several other places; still others (Hailes, Westminster, Schwerin, and elsewhere) were destroyed at the Protestant revolt. Today, the processions and other exercises in honour of the surviving relics transport one back to the ages of Faith; if it is questing for the Grail you seek, they are good places to start. But there is another class of Holy Blood relics. If those referred to so far can only be venerated, because of their separation from Christ’s Divine Nature, His Eucharistic Blood is another thing entirely, being as hypostatically united to said Divinity as when He walked in Palestine. Now, it has happened throughout the Church’s history that the Blessed Sacrament – in either or both kinds – has been the object of miraculous occurrences. In some cases, apparent bread and wine have turned to flesh and blood; with others, hosts stabbed or otherwise abused have bled; in still others, old hosts placed in water to dissolve have shed blood. The would-be Grail-seeker must add a whole other set of shrines to his itinerary: the miracles range in time and space from Lanciano in 700 AD to Buenos Aires in 1996 – and, reportedly, even today. To visit any of these shrines is to come face to face with the mystery at the heart of our religion. Seeing them all might take a lifetime; in today’s economy, seeing any one of them might be too much for the budget. But the essence of all of this Grail questing need not take us far from our hometown. Devotion to the Precious Blood of Jesus, after all, is really what the Grail Quest was all about. My first encounter with it was as a teenager, when I encountered a copy of the “New Revised J.M.J Triple Novena Manual,” put out by Fr. Stedman, who had authored several versions of the Missal we had around the house – and published by the Confraternity of the Precious Blood. This booklet introduced me to all sort of prayers and devotions –centering around the Precious Blood, that were both inspiring and intimidating, such as those honouring the seven sheddings of the Precious Blood. It also introduced me to the contemplative Sisters Adorers of the Precious Blood, whose foundress, Mother Catherine Aurelie Caouette, was truly one of the greatest women French Canada ever produced. The chapel of the order’s Motherhouse in St. Hyacinthe, Quebec is a monument to the power of the devotion. Another worthy whose heart was captured by this devotion was St. Gaspar del Bufalo. Called the “Hammer of Freemasons,” he had, as a young priest, refused to swear allegiance to Napoleon when Bonaparte exiled and imprisoned Pius VII and annexed Rome to France. For his troubles he was imprisoned; on his release, inspired by the blood Christ shed for all of us sinners on the Cross, he began preaching in the streets of Rome. Eventually he founded the Missionaries of the Precious Blood, together with whom he was sent into bandit-ridden territories of the Papal States to convert the ruffians – as perilous a quest as ever Arthur’s knights performed. They were successful; his work inspired St. Maria de Mattias to found the Sisters Adorers of the Blood of Christ. Throughout the 19th century, other orders of Precious Blood Sisters were founded – in Schellenberg, Switzerland and Mariannhill, South Africa, from which houses were founded all over the world, including the United States. Nor is this spirit exhausted today, as shown by the founding in 2006, in Regensburg, Germany, of the Spiritual Family of the Holy Blood, an umbrella organisation comprising communities of brothers, sisters, and laity. During that century figures associated with other orders promoted devotion to the Precious Blood, including the Passionist St. Vincenzo Maria Strambi (who introduced the now general custom of consecrating July to the Precious Blood); St. Maddalena di Canossa, foundress of the Sons and Daughters of Charity (and to whom is attributed the devotion to the seven blood-sheddings); and Bl. Antonio Rosmini Serbati, founder of the Rosminians. The Papal seal of approval was placed on the devotion in 1849, when Bl. Pius IX, in gratitude for being able to return to Rome after the revolution in the previous year, added the Feast of the Precious Blood to the universal Calendar. The Archconfraternity of the Precious Blood, (whose founder, Msgr. Francesco Albertini, was St. Gaspar’s mentor) headquartered at the church of San Giuseppe a Capo le Case in Rome, is the central lay organisation for the devotion in the world: fittingly they are custodians of another relic of Christ’s blood. It gave birth to many other such confraternities, while others, originally independent, have been aggregated to it – such as the ones in Brooklyn and at London’s Brompton Oratory (founded by Fr. Frederick Faber, who greatly popularised the devotion in English. The Precious Blood confraternities issue their own scapular. Thanks to all of these individuals and groups, devotion to the Precious Blood became ever more popular among Catholics. But the apogee of the practice was reached under Bl. John XXIII. The Pope, a great devotee of the Precious Blood throughout his life, issued on June 30, 1960 the Apostolic Letter Inde a Primis. He further approved a new Litany of the Precious Blood, and inserted the invocation “Blessed be His Most Precious Blood” into the Divine Praises. Of course, devotion to the Precious Blood cannot be observed in isolation. As John XXIII observed, there is a bond between it and devotion to both the Holy Name and the Sacred Heart. 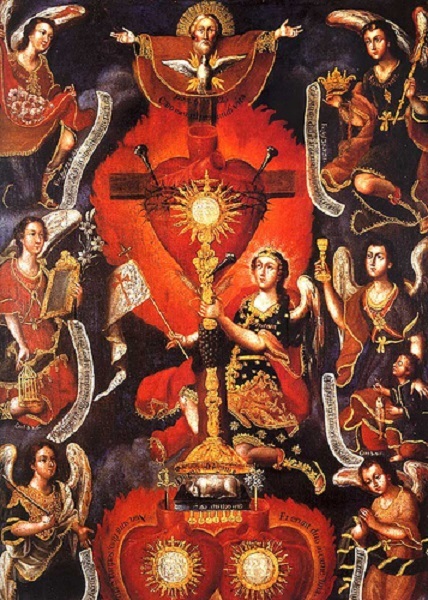 The latter connexion is particularly close, for obvious anatomical reasons – many a depiction of the Sacred Heart shows Our Lord’s blood dripping from it. So too with all the other devotions to Christ: the Divine Mercy, with spiritualised blood as well as water emanating from His side in the famous picture; the Five Wounds, which are depicted on both the arms of Portugal and the banner used in the Pilgrimage of Grace; the Holy Face, so beloved of St. Therese of Lisieux; Christ’s Shoulder Wound, about which He spoke to St. Bernard of Clairvaux; the Kingship of Christ; and several others, all of which involved the shedding of His blood. Moreover, as with the tie between Christ’s Holy Name and that of Mary, the Sacred and Immaculate Hearts, and Christ’s Kingship and His Mother’s Queenship, the Precious Blood is also tied to the Blessed Virgin, in whom was its sole human origin. But above all, devotion to the Precious Blood is tied to the Holy Eucharist, wherein that very Precious Blood comes down to Earth every day on altars across the globe. Present (alongside the Holy Body of Christ) under both the appearances of bread and wine, it is received by the communicant regardless of whether or not he receives both species (this is why, in the Eastern Rites – Catholic and Orthodox alike – infants receiving only the Transubstantiated wine are not believed to be deprived of the Body thereby). Where the relics of Christ’s blood are purely human, separated from His Divinity, that which appears in the chalice and on the paten is united with It, as It was when He walked in Palestine. In the Novus Ordo or Ordinary Form of the Mass of the Latin Rite, Eucharistic Ministers often hand a chalice to communicants to receive the Precious Blood from. Both because it is a recent innovation, and because for many it seems a violation of the Congregation for Divine Worship’s 1980 Instruction, Inaestimabile Donum (point 9, “…It is not permitted that the faithful should themselves pick up the consecrated bread and the sacred chalice, still less that they should hand them from one to another.”) many traditionally-minded Catholics prefer not to receive from the chalice. But there need be no such objection as regards intinction, nor in the way it is received in the Byzantine Rite or the Anglican Use of the Catholic Church (in the latter case, it is done as it was when Communion in both kinds was first revived in the Latin Rite – the Priest lifts the chalice to the communicant’s lips, wiping with a cloth immediately thereafter). But again, you receive the Precious Blood when receiving only the Host. … Josephe prepared to celebrate the sacrament of the mass. And after waiting a little, he took in the sacred Vessel a wafer apparently of bread. And at the elevation there came down from heaven a figure as of a child with a face as red as if it were aflame with fire; and He entered into the bread so that those present saw clearly that the bread had assumed the form of carnal man. When Josephe had held it thus a while, he put it back in the Holy Vessel. That same vision given to Sirs Galahad, Perceval, Bors, Gawain, and the rest is given you and me at every elevation at the Mass. The true Quest of the Grail is to be worthy of it with God’s grace, and of spending eternity with Him who is the Master of the Grail in the Land of the Living.